I’ve been participating in Case4Space, a research project, led by Rex Miller, that pools the experiences of a handful of industry experts to determine what drives productivity in the workplace. The project has allowed us to take a closer look at our work environments and take into account the changes that are happening. Three maxims in particular have emerged: We must create space that helps us to manage and nourish ideas; space should not be looked at as just another overhead expense; and we must plan for disruption. Much of Case4Space’s focus has been on the relationships of underlying business goals and strategies to people and their workspace, and we have discovered several innovative organizations that have very unique cultures and high engagement that show a corresponding consistent high level of performance. The common denominator of these groups has been a focus on people, talent, well-being, freedom of choice, level of engagement, and culture. None of these organizations could be described as traditional; upon initial inspection they often confound, but they tend to have a strong sense of place and a high level of trust. Case in point: some of the discussion has revolved around the tenure of the companies listed on the S&P 500. In the early 1960s, the average time a company spent on the list was almost 60 years. Today it’s about 15 years, and in the past 10 years approximately one-half of the companies have dropped off the list and new ones have emerged. We are talking about 250 of the largest companies failing to capture innovation and failing to shift to stay current. This is the cost of not recognizing change and capturing new ideas. Since 2002, Google, Amazon, and Netflix have joined the S&P 500, while Kodak, Palm, and Compaq have all been forced off. The stories about the companies that have fallen off the list are mind numbing. For example, Kodak invented digital cameras, but was caught up selling photographic paper and one-time use cameras. Caught in a rapidly changing economy, large, highly rated companies like Kodak missed the shift and were wiped out very quickly. 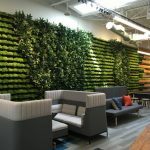 We know that our spaces need to be designed to stimulate ideas and innovation, allow for very rapid iterations of often-gray concepts, and be able to go from concept to product or service very quickly, all at a competitive cost. They need to include a way for everyone in the organization with ideas—even those people beyond the physical walls—to be heard. They must include technological tools and the ability to reach out and connect to others who can contribute their thinking. These new workspaces must be consistent with the corporate vision and the systems and processes that are in place. Careful education and change management will help people to understand how the space works. Many organizations are building space, but employees must know how to use the space effectively—it’s not always intuitive. Not very long ago we thought of office space and the workplace in a very simplistic way, and to some degree it was. Office space is accounted for as an overhead expense, something necessary to house an organization’s people. The biggest discussion was most frequently around whether or not it should be open or closed, and to what degree. Today, we are much smarter, the workplace is much more complex, and the real estate and design industries are racing to keep up and understand the dramatic change. Most businesses and commercial real estate organizations are still focused on office space as a necessary evil, an afterthought, an expense to be reduced, and efficiency maximized. But we have reached a tipping point, and that type of outdated thinking is changing. Now, it must be acknowledged that an organizations’ workspace is where every single detail necessary to operate comes crashing together. The range is from leadership, to administrative, to the creative, and to the management—all the support, tools, people, relationships, and clients. We are building highly flexible work environments to accommodate extremes: short term/long term, and expansion/contraction. As humans we interact with people in a broad range of conditions; the space must support the conversations and rapid exchange of ideas that we are having with people and are necessary to sustain our businesses. My visualization of the office today is like an atom, with a massive number of particles flying around. The particles are issues, intangible concepts, news, threats, and opportunities. They are ideas, and these ideas fly through their space at very high speeds, occasionally crashing together; they iterate, change and bounce off each other, often in different directions. A few are captured, spur thought and innovation, and are leveraged to grow and sustain the company. The workspace needs to be planned and organized in a way to catch these ideas; to discuss, improve, change, promote and sort them rapidly with a highly intuitive and analytical methodology. The best ideas are then leveraged, iterated, built, and grown in order to sustain and innovate the entire organization. Many of these ideas are small—they might be perceived as distractions and are often, as a result, wasted. You’re often not sure which ones will be the sparks that create disruptive change or the next Black Swan. They are flashes in a moment of time. One thing that is clear is that disruptive change is often unpredictable, and it often conflicts with the core business of the organization. We cannot see the future clearly, let alone understand its impact, so we discount the risk associated with it. Our organizations are frequently bound by traditions, nostalgia, and pride; we resist change and stay focused on core products—the wrong things at a huge expense. We have evolved into an economy based on ideas—intangible concepts that jump from brain to brain, aided by technology at light speed. We see ideas that have significant value only for brief periods of time. What’s worse is that much of our financial and institutional systems are still based on collateral from the old economy associated with land, labor, and capital. How do we capture and harness these ideas and leverage them to build, maintain, and grow healthy sustainable companies that embrace change and are better suited to the new economy? Our workplaces today must be designed for constant and increasingly more rapid change. If this principal is not recognized, we risk missing the shifts in the industry caused by knowledge-driven disruption, and we risk obsolescence and death. In the end, people—not machines—are able to build ideas and spot emerging trends. It requires a very broad range of participation, and not just at the C level. An organization must have the tools and devote the resources to exploiting new opportunities; they must sort through multiple ideas quickly to be able to develop a successful one that pays off. The right ideas will more than pay for the distractions. The right conditions to spur and support creativity must exist within the workplace—if they don’t, the organization becomes focused on efficiency and small incremental improvements and misses out on new opportunities. Organizations without the tools to adapt will miss the opportunity to seize the change necessary to create and innovate, to embrace new ideas, and to keep up with the competition. They risk slow growth or, even worse, catastrophic failure. In other words: there is a very strong case for space. Photos and key takeaways from last week’s Chicago Work Design TALK. Consider Google’s price per share, Bob, which listed at nearly $1,200 February 12, and the case4space becomes even more compelling. Tomorrow’s winners in the global economy grasp the importance of ‘agency,’ giving knowledge workers a ‘voice and choice’ in the change process, as Google’s global head of real estate and workplace David Radcliffe terms it. The foundation for the break away from command and control lies within the community stakeholder leadership model, and it’s a bottom up phenomenon resulting in outcomes like growing talent retention rates, higher innovation rates, better productivity, stronger competitive advantage, faster speed to market and obviously higher profits and shareholder value.